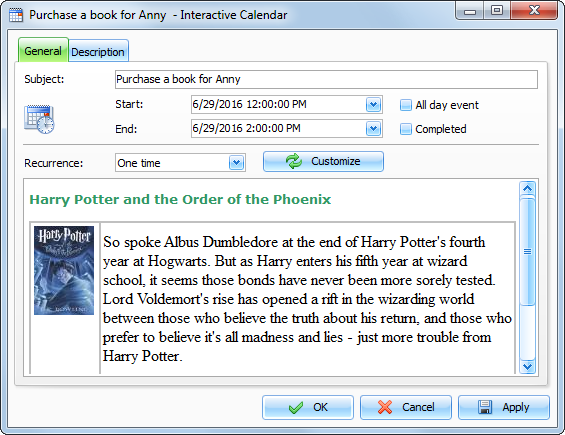 To add or edit appointment just double click any date cell on the desktop calendar. It will bring up a new appointment creation window or an appointments management window if there are any tasks already scheduled on that day. If the appointments management window is opened, click the "New" button to create a new appointment or "Edit" button to edit existing entry. To add a new appointment in the main window, press the "New" button or double click the empty area inside the viewing area. You can use shortcuts Ins or Ctrl + N as well. Also you can create a new entry by entering data in the upper row. To edit an already existing entry press the "Edit" button or double click the record you want to edit in the viewing area. Also you can use the Ctrl + Enter shortcut. Subject - a records title. Start date and time when the appointment is started. End date and time when the appointment has to be completed. All day event - marked when the appointment is all day event. Completed - turn on this box to mark entry as completed. 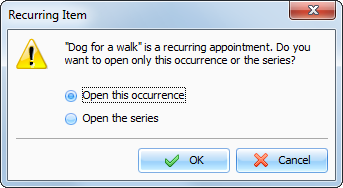 Recurrence - these settings enable you to make any appointment a recurring one. When you change the model or press the "Customize" button, the extended recurrence options window opens, giving you an opportunity to select and set an appropriate recurrence template. Description use this field to enter an additional appointment information and its description. The description field supports rich text formatting (RTF), pictures, tables and hyperlink insertion. See Working with text and descriptions topic more for details.